Bicicletta unica. Telaio full carbon mono scocca. cerchi acciaio, tubolari, forcella carbonio, montata shimano. Dipinta a mano. Abstract expressionist Jackson Pollock, like many of our heroes, had a penchant for destruction. While he may have only lived until the ripe ol’ age of 44 when his alcoholism finally got the better of him and he crashed his car while under the influence, he remains one of America’s greatest and most influential painters. 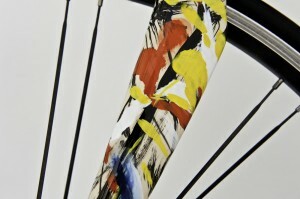 The lightest of our collection, this single speed bike pays homage to Convergence – his 1952 painting said to be about freedom of speech. 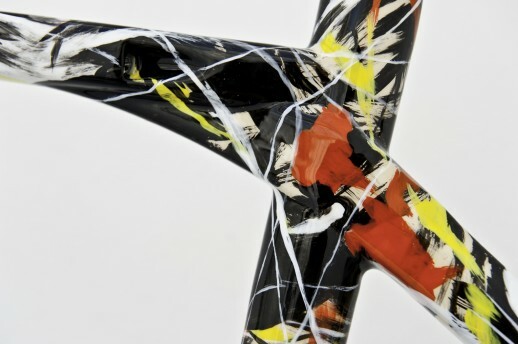 It is a bike made for the true art lover.